Game Challenge, GDC, PAX East, Oh my! Hello everyone! Petricore team member Christian de la Cruz here! It’s been an incredibly busy and fun month for the Petricore crew with the MassDiGi Game Challenge, the Game Developers conference and PAX East we were really up and about! We thought it’d be really cool to share our experiences! To start off the “fever” our CEO, Ryan Canuel, and our Lead Artist, Christina Andriano, were both judges at the MassDiGi Game Challenge! It’s a one-of-a-kind pitch competition and event that helps aspiring game developers launch new games. Programmer, Chris Bruno, and CTO, James “Spav” Spavold, also attended to check out all the exciting new projects in the area! Our Boston area scene is filled with loving friends who support us and everyone was happy to see old friends again. A special shout out goes to Bounce.Wav, Obio and Connexi! 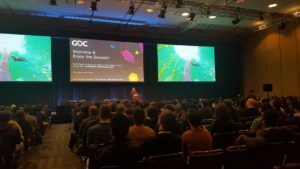 As for the Game Developers Conference (GDC), it was quite the adventure! Ryan and I both attended and had very active week. Filled with amazing panels, round tables, and meetups about everything you can think of! Art, Design, Programming, Production, and Business. Ryan’s favorite Panel was a round table run by Jesse Shell called “The Studio Survival”. Jesse set the stage for some fantastic conversation, studio owners got to sit down and ask questions about how their studio can tackle the big problems that the Veteran Studio Owners have already solved. Ryan says that the rush of problem solving skills of the group were superb and that by collaborating with these great minds Ryan has a stronger ability to lead Petricore! I enjoyed my time by being a Conference Associate! I was part of a fantastic group of people wearing bright purple “neon” shirts who are there to help the conference run. I met a lot of bright individuals and shared perspectives on how we can change the industry! My favorite panel was “World Building: The Power of Developers in Representing Diversity” where we talked about the benefits of bringing different cultures and ethnicity’s into the story of games. Finally last but definitely not least, PAX East was as exciting and packed as ever! We showcased our latest game Battery Boy at the “PreGamer” Party located right next to the Convention Center at Laugh Boston. The energy of the room preparing to enjoy themselves for PAX was a joy to experience as people came to check out our game. 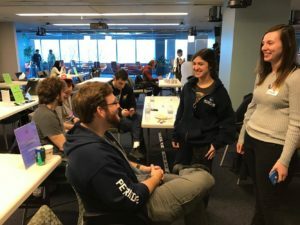 We also helped to sponsor, and attended, the Made in MA party run by MassDiGI, where hundreds of local developers gathered to showcase their work. During PAX our CEO, Ryan, spoke on two separate panels. The first was “Wait, Wait, That’s a Bad Idea” where people got the chance to pitch their game idea to a panel of judges and one lucky winner walked away with an answering machine. The second was “Battle Decks: Game Pitch Karaoke” which was hosted by the wonderful Worcester Game Pile where people got the chance to pitch game presentations they’d never seen before. Overall we had a blast at PAX East this year! Included in Boston 25 Worcester Special! Copyright Petricore, Inc. All Rights Reserved.